On Monday, May 30, Williamsburg Memorial Park proudly hosted the Annual Memorial Day Celebration for the 48th consecutive year. In spite of rain, which was sometimes heavy, more than 200 people braved the elements to show their respect for the men and women who gave their lives to protect this great nation, its communities, and its citizens. Because of our ongoing park expansion, all guests, except those who are disabled, were asked to park at the AMF Williamsburg Lanes, which graciously let us use its parking lot. Once parked, guests were promptly shuttled directly to tent-covered seating in two vans, including an environmentally friendly Mercedes-Benz donated by Bucktrout of Williamsburg, a local, family-owned funeral home. “The new shuttle system worked great! Everyone I spoke with was in good spirits and seemed to appreciate the curbside service,” said Andy Bradshaw, Williamsburg Memorial Park Board of Directors VP and shuttle rider. At the cemetery, which was adorned with more than 1,100 small American flags, several disabled guests began arriving by car. Sensing the potential safety risks imposed by people trying to park and then navigate the rain-soaked grounds, Scoutmaster Bruce Laubach from BSA Troop 103 quickly organized our very first valet parking. It was a stroke of genius that proved to be immensely popular. The main event began under a light rain at 10 am with a traditional bell ceremony performed by Commander Bill White from American Legion Post 39. Afterward, Jerry Fields, Brigadier General, US Army (Ret), started the program, which was followed by an invocation by Rev. Charles Mullally, Lt. Colonel, US Army (Ret), and the advance of colors by the James City County Fire Department Color Guard. This years program featured patriotic music performed by a variety of talented people, including Sydney Snowden, Dalia McCoy, Alberta Prather, and Scherry Barra; a moving speech by Dr. John Pittman III, Colonel, US Army Reserves; and a 21-gun salute by the VFW Post 4639 Honor Guard. The ceremony concluded with Taps, played by Jake Sanford from Toano Middle School, and the ever-popular God Bless the USA, beautifully sung by Ray Gresham, 1st Sergeant, US Army (Ret). At the end of the celebration, speakers, organizers, and performers received a standing ovation from event attendees, with several guests seen wiping away tears. “No words can express the tremendous gratitude we have for the various organizations that made this event possible, including AMF Williamsburg Lanes, Bucktrout of Williamsburg, the Combined Veterans Groups, and especially the young men of BSA Troops 103 and 155,” said Angela Byrum, General Manager Williamsburg Memorial Park. The 2016 Memorial Day Celebration was a resounding success, in spite of adverse weather conditions, and demonstrates the tremendous resolve and respect our community has toward its veterans and first responders. 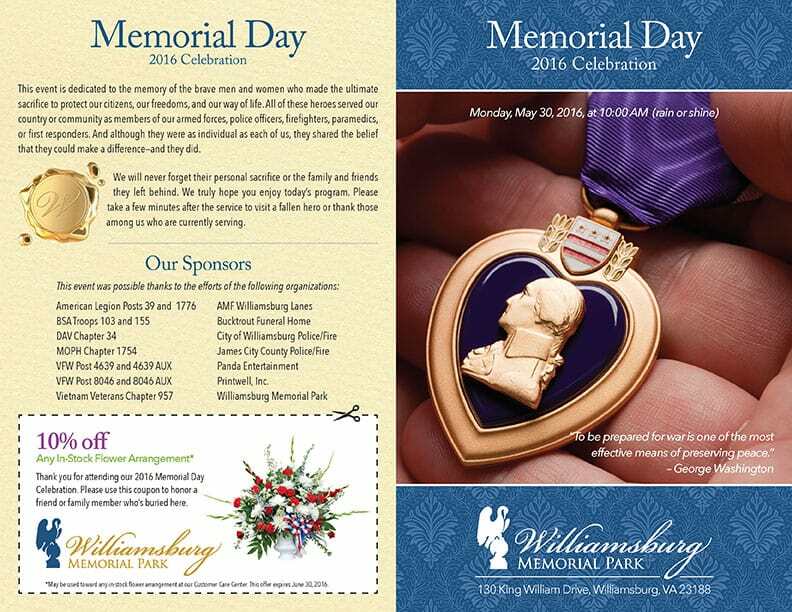 Williamsburg Memorial Park is honored to have once again hosted this wonderful event. We look forward to an even better celebration next year. Click on the image below for a PDF of the 2016 program.